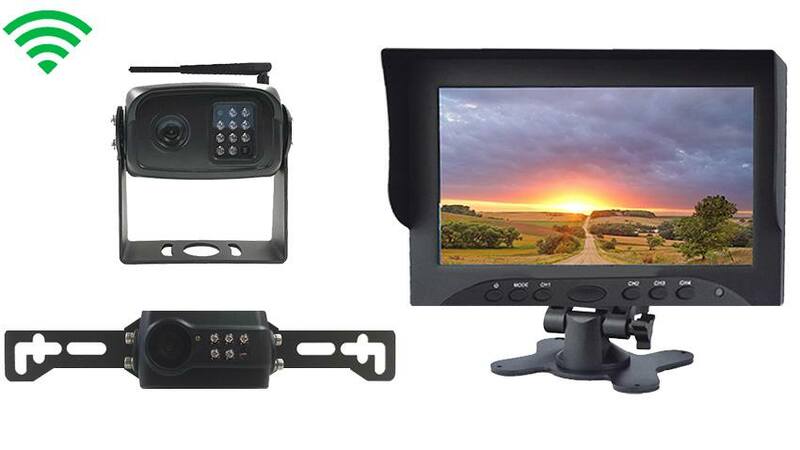 This Aftermarket Digital wireless backup camera system comes pre-configured with our 7-inch dash mounted monitor it has a minimum wireless range of 125ft. The rear view monitor features 2 digital input channels that will allow you toggle between the truck camera and the trailer camera. Also, the monitor is bright enough for full color daytime image even in direct sunlight but auto dims when it gets darker for a comfortable view night time image. Keep in mind that this 5th wheel backup camera system has the transmitters and receivers built into the digital monitor and both digital cameras, that means the other than 12 volts there are no wires for you to connect. The monitor in this system can be upgraded to a larger size, any changes you want to make can be made by using the customize and upgrade menu at the top right of this page. The aftermarket Digital License Plate rearview camera is mounted by screwing your current license plate screws through its brackets; it’s a very simple installation. The camera can also be adjusted by angling the camera up or down so you can get the perfect view of your car. There is no need to drill any holes or install mounting brackets. This reverse camera has a 120° viewable angle which provides a great view Trucks backing or hitching. The license plate backup camera it is full color, waterproof and has military grade automatic night vision. The camera and mount are constructed of steel for extreme durability in the roughest weather conditions. The wireless Birds Eye View Digital RV Box backup camera Has a 120° Degree viewable angle, its waterproof and has auto night vision. The camera is one of the most durable we have, with incredible adjustability and night vision clarity. Both cameras have the added feature of doubling as observation rear view camera which means you can leave 1 or both camera on continuously while you driving down the road, this comes in handy when you changing lanes and we also have a lot of customers who leave the cameras active while their parked so that they can see their surrounding 25/7. Some popular upgrades for this system are the high definition lenses and the mobile DVR feature which can dramatically improve the quality and enjoyment in using this system. These changes and more can be made by using the customize and upgrade menu at the top of the page. The included cameras are both wireless camera so there is no need to run cables through your truck or camper. This makes the installation of the entire system very quick and easy. The system includes all parts needed to cleanly connect both cameras and monitor wirelessly to your Truck and 5th Wheel. Keep in mind that this digital wireless system has a 125ft range for both cameras, it can go through any wall in any vehicle.